In addition to performing in UM's top ensembles (SWE, UMSO, Marching Band), we host studio events throughout the year and students get real-world performance experiences in the region's orchestras. 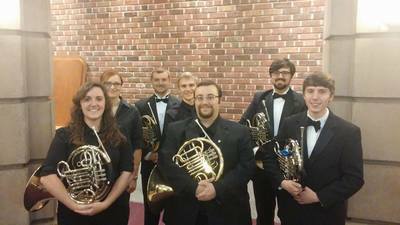 In the last year, UM horn studio members have performed in the Helena, Great Falls, Bozeman, and Missoula Symphony Orchestras. Our annual Holiday Horns! event has been a huge success. Co-sponsored by the UM Horn Studio and the Montana Horn Club, the annual event is for ALL horn enthusiasts, students, and teachers across western Montana. Come join us this Decemeber! There was a story in the local newspaper about our first event in 2015. Founded by Zach Cooper in 2015, the Montana Horn Club brings together Montana's top community members, university students, and symphony hornists. 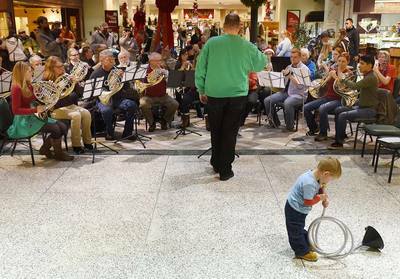 Pictured above, the MHC performed as part of the First Night Missoula event on New Year's Eve, Dec. 31, 2016. 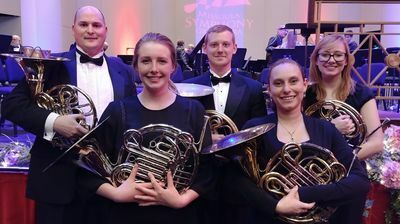 UM students have the distinct pleasure of collaborating and forging professional relationships with the region's symphony musicians and educators BEFORE graduation. In 2017, we teamed up with the Missoula Mendelssohn Club Men's Chorus. In addition to music by the MHC alone, from a Bach prelude and fugue to a polka, we collaborated with the Mendelssohn Club to perform three famous works from the literature by Mendelssohn, Weber, and Wagner.